Bulldog is the perfect blend of heart, hustle and muscle. Fitness-fueled yoga plus bass-bumpin’ music makes for one sweaty, energetic, heart-pumping brew. 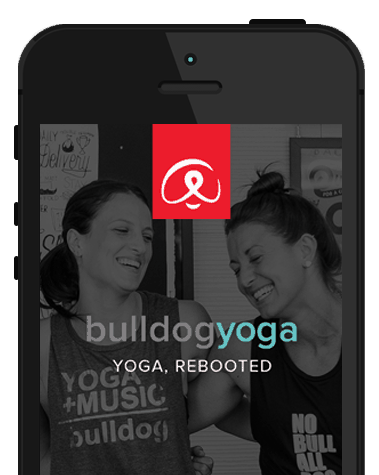 Bulldog is yoga, rebooted – free from chanting, free from instructions in Sanskrit, free from those uncomfortable moments. We bulldogs take risks, work to keep our body and brain healthy, and don’t take ourselves too seriously. We’re the first on the dance floor (even if there isn’t one) and embrace new adventures. We seize the day…and we sweat! Whether you’re new to yoga or looking for a refresher, bulldog basics is the perfect way to start getting your bulldog on. If you have questions about our classes, are interested in becoming a bulldog yoga leader or just want to say hi, please fill out the form or use the contact information below.